No need to choose between the close-quarters advantage of a red dot sight and the long-range benefits of a scope. Get the best of both worlds with a simple flip of the magnifier. 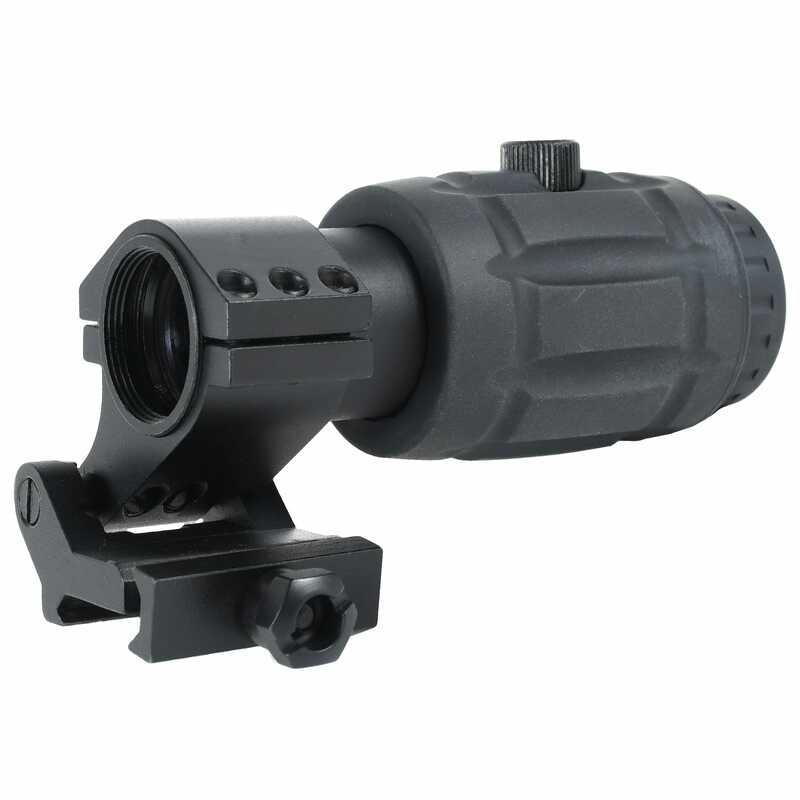 This magnifier is designed for use with the AT3 RD-50 and AT3 LEOS red dot sights. The height of the magnifier is a perfect match for “absolute cowitness” red dot sights like the AT3 RD-50 with .83″ riser. For use with taller sights like the AT3 LEOS or RD-50 with 1″ riser, a spacer is included to raise the height of the magnifier. Both the red dot and magnifier we're easy to install and worked as advertised. They were easy to zero at 25, 50, and 100 yards. I was pleased to be able to flip the magnifier to the right so the iron sights could be used. Well update to my last post. The magnifier is great and is Crystal clear. Problem I had was with the mount itself. Got in contact with AT3 was sent a new mount. This new mount is solid as can be and I do not expect to have any problems with it. The old mount I had was the earlier version, the mount has changed since then and it is a much better design in my opinion. As for customer service I have never dealt with a company that is so compassionate in standing behind there products that they would do anything to fix a problem a customer is having. Thanks for sharing your experience, Brian. We work hard to meet expectations like yours, we're glad we hit the mark for you. Cheers! Works very well. I haven't experienced any of the wobble issues some here have seen. Very pleased with the product. Thanks for sharing your feedback, Glenn. We're glad you're satisfied with your purchase. Great Magnifier but the wiggle has gotten bad. I love the magnifier with my Leo's red dot sight. It had wiggle when I first got it but at the range this weekend it was really bad when it is flipped in the upward position. There is so much play it's almost unusable at this point. Sorry to hear about the issue, Brian. Sounds like you received a defective product. If you can please reach out to us so we can further assist.